Well, it was April 2009 and I had been on withdrawl for too long. Time to go back to the mountains. Even before Catherine got pregnant and the twins were born, I had already decided that in the spring of 2009 I wanted to go on a multi-day mountain extravaganza. Only the exact time and place had not yet been defined. I chose the Easter weekend and the following week for two reasons: First, Catherine could go to her parent's house for the holiday and benefit from the numerous hands available there (mother, aunts, other) to help with the kids. The second was that in the week after Easter, Matthieu Delpierre and some of his friends would be skiing in the French Alpes and we had agreed that I would join them for a couple of days. We left Namur on the Good Friday and drove to the Guirkinger house in Oudrenne in Eastern France, where Catherine's parents had already arrived. Originally I had planned to just drop the three off and then continue on my way, especially since I only had 5 days before I had sort of promised I would join the skiing troop. However, it took some time to leave Namur and then to get the kids properly installed in Oudrennen (setting up the beds, the bottle warmer, the sterilyzer, etc), that it was too late in the day for me to go South. I therefore decided to sleep in Oudrenne and get up early to drive for a few hours and hit a few mountains by sunrise. This worked out nicely, I left the house at about 3am and reached the foot of my first destination about 3.5 hours later after having slept in the car on the roadside for a few minutes. That first destination was the Ballon d'Alsace, one of the prominent peaks in the Vosges area near Strassbourg and also the highpoint of the French departement Territoire de Belfort. 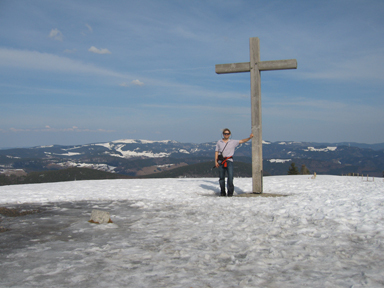 The Vosges mountain range is not very high as the highest peak, the Grand Ballon, tops out at 1424 meters, but they still make for some excellent hiking, fine views and lots of snow in the winter. In addition the range includes various French department (counties, sort of) highpoints, and thus needs to be visited by me on my unsurpassed effort of climbing all 96 highpoints in France. So, far I had done 3, and it was about time for another one if I ever wanted to finish that list. I thus arrived near the top of the Ballon d'Alsace, because a road (luckily snow-free) passes near the summit, and after parking the car, it only took me a leisurly 15 minutes to walk the few hundred meters to get to the summit. I did have to walk through snow, however, that was still frozen this early in the day and even though I could have walked through the snowfree woods nearby, I preferred to kick steps into the hard snow, in order to make the hike a bit more exciting. Once on the top, I took the obligatory summit shot and surveyed the area including my next destination of the day, Ballon de Servance, a couple of kilometers to the West. I briefly entertained the idea of leaving the car parked and hike down the valley separating the two mountains and then up again, but decided against it because of all the snow and the fact that a vast forest also grows inbetween the two peaks. From the summit the direction may seem obvious but from within the trees it was less clear, I would likely get lost or at least lose some time before getting to the other peak. Instead I descended back to the car and drove down into the valley towards a trailhead that I had noticed earlier. According the map a forest road was leading up to a col between the two mountains and from the col a half a km hike following a GR led either accross the summit or pretty close to it (the true highpoint was not clear from the map). So I got into gear, put on my hiking boots (smart decision because I was going to encounter a fair amount of snow later on) and set out. I followed the forest road for 1.5 km before the occassional patches of snow turned into one solid mass of - by now - fairly soft snow. I had ancle high boots but no gaitors and thus could not avoid that my feet were getting wet quickly. But it was warm enough and I thought it would only take me another 15 minutes or so to get to the summit, because of the nice "shortcut" I thought I had seen on the map. It was indeed a short cut but the terrain was getting fairly steep and it took me probably much more time breaking trail that it would have taken if I had stayed on the trail. The trail was probably snowed in as well, but maybe some occassional hiker had already been there before me and compacted the snow. However, those thoughts were purely academic, as I was following faint traces of skis that obviously had had no problem in the snowy terrain. Eventually, however I arrived at the second col and found the trail again and after following that one for a few hundred meters stood in front of a fence with signs posted everywhere declaring that it was military terrain and the taking of photographs was not permitted. A few radio towers and fairly run down building were the only remnants of what at first glance must at least date back to cold war times and considering the geographic location more likely the 2nd World War. Whatever the case, I took pictures and eventually reached a stone marker what I declared to be the highpoint of tge Ballon de Servance, highest point in the Haute-Saône department (not too clear due to the general flatness of the summit plateau). After a few minutes a hiked back to the col, found a refuge and a memorial as well as some remaining airplance junk of a surveillance crash in the 60s, and was soon on my way back down to the car. I did, however, take a different route down, following GR? and in the valley reaching a point lower than where I had parked my car. That meant that I had to hike back up again, but eventually reached the car (at around noon). After stopping at the source of the Mosel river, I headed east into Germany and in the afternoon drove to the top of the Blauen (or Blauchen), a mountain in the southern part of the black forest and reaching 1165 meters. A road leads to the top and since it is a dominant point, one can see from the top the black forest, the Vosges, the Jura and the Alpes. That is to say on a nice day, one can see all those things. When I climbed the view tower at the summit, it was a nice day, but still so hazy, that I could not see anything but the rest of the black forest, including its highest point, the Feldberg, and the fourth highest point, the Belchen, may next destination. Reaching the parking area of the Belchen, I hesitated between taking the still operating skilift or going on foot, I decided for the latter, because I had already driven to the top of the Blauen and it was about time for some workout again. The Belchen summit is at 1.414 meters and after hiking through the snow for 30 minutes and passing the restaurant located a couple hundred meters below the summit I eventually reached my fourth summit of the day. I was also alone at the summit, always a fun experience, and had similar views than the ones I enjoyed on the Blauen, except that now I was 15km or so further north. Still no Alpes or Jura, but plenty of black forest visible, especially the Feldberg. On my way down I took the gondola, because my shoes were soaking wet and also because I wanted to listen to the live broadcoast of the soccer matches of the day. That I did, on my way away from the black forest towards Kempten in the Allgaeu area, from where I would go onto more mountain adventures the following day.